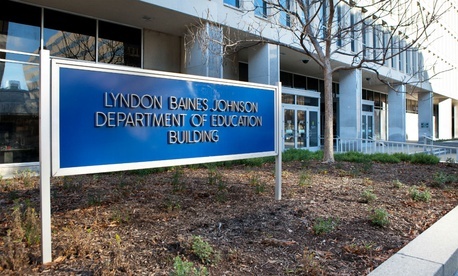 Officials with the largest union representing federal employees have filed an unfair labor practices charge against the Education Department, after the agency unilaterally implemented a new collective bargaining agreement without approval from the labor group. According to a charge filed with the Federal Labor Relations Authority by the American Federation of Government Employees, agency and union leaders were in the midst of ground rules negotiations on a new labor-management agreement, only to be informed that the agency would draft a collective bargaining agreement on its own. That document was released last week and took effect Monday without approval from union members. In a statement, Education Department spokeswoman Liz Hill blamed the situation on labor representatives. AFGE assistant general counsel Ward Morrow said the labeling of the new labor roadmap as a "collective bargaining agreement" is farcical. The new document removes dozens of provisions that existed in the agency’s 2013 agreement, including telework; child and elder care; guidelines for promotions, step increases and bonuses; and protections for employees with disabilities. The results have been “chaos,” AFGE representatives said. The new bargaining agreement also significantly curtails the ability of union representatives to use official time, a practice where unions are paid to address workplace issues. The document forces them to use unpaid leave for such duties. It reduces the number of stewards authorized to use official or representational time from 75 under the previous agreement to 10, and it requires employees to request permission from their supervisor before using unpaid leave for union representational work. The document also ends the practice of the department providing office space to the union at both headquarters and 10 regional units. Morrow said the union is seeking a so-called “status quo” remedy, which would force the Education Department to abide by the 2013 CBA until good-faith negotiations with the union are completed to iron out a new agreement.